Delhi with its chaos and numerous noises can be too overwhelming at first. But if you look closer, you’ll see that this city is full of ancient monuments, interesting museums and beautiful sights. 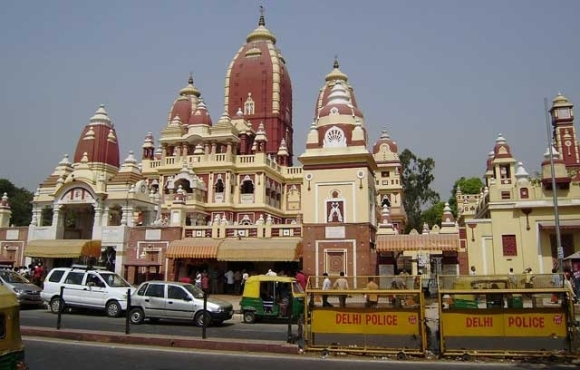 Being one of the historical capitals of the world, Delhi numbers a lot of attractions. Here are some of them. Red fort is one of the most important historical buildings and a symbol of architectural beauty and the power of Indian dynasties. It was built in 1648 and has had a rich history. It is one of the most popular tourists’ places in the city. Inside the fort you can find a gallery, archeological museum, shops and memorial museum. 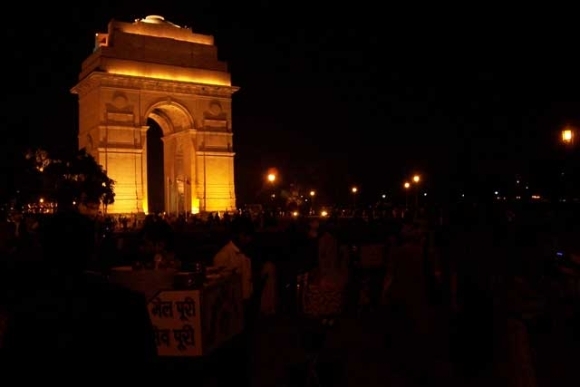 India gate is a famous symbol of Delhi that immortalizes the memory of 90 thousand of solders of British Indian Army who died in the First World War and the third Anglo-Afghan War. The names of the soldiers are engraved on the walls. Green lawns around the gate are the popular resting place during days and evenings. 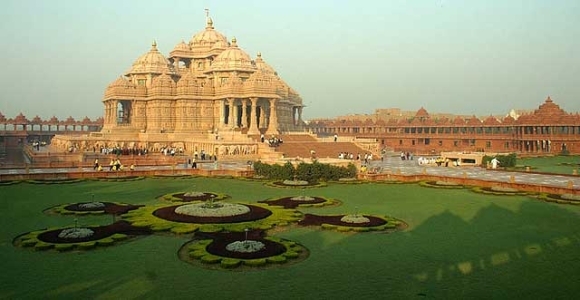 Akshardham is a Hindu temple complex that shows thousand-year-old traditions of the Indian and Hindu culture. About 70% of tourists who come to Delhi visit the complex. It was officially opened for tourists in 2005, and in 2007, the Guinness World Records called it the biggest Hindu temple in the world. The complex consists of a big temple, large garden with numerous lawns, trees and bronze sculptures, artificial canal, and a movie theater with different cafes, shops, gardens and a musical fountain. Raj Ghat a famous memorial to Mahatma Gandhi located on the Yamuna River. 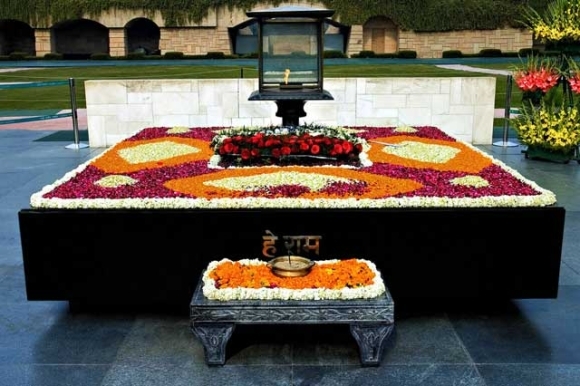 The black marble platform is located on the place where Gandhi was cremated. Today more than 10 000 tourists visit this place every day. Every visitor has to take his shoes off before approaching the memorial as a mark of respect. Humayun’s tomb in Delhi was built on the orders of his wife Bega Begum in 1562. The tomb was added to the UNESCO heritage list in 1993 and since then there have been massive restoration works. 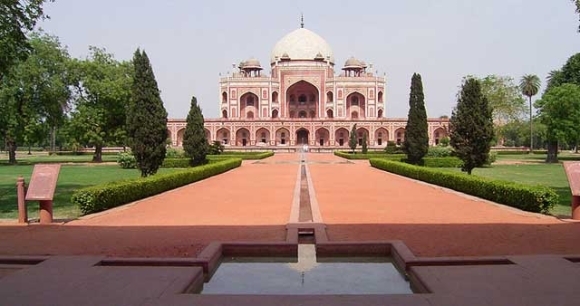 The complex includes the tomb of the Emperor Humayun, the grave of his wife and other famous representatives of Moguls. 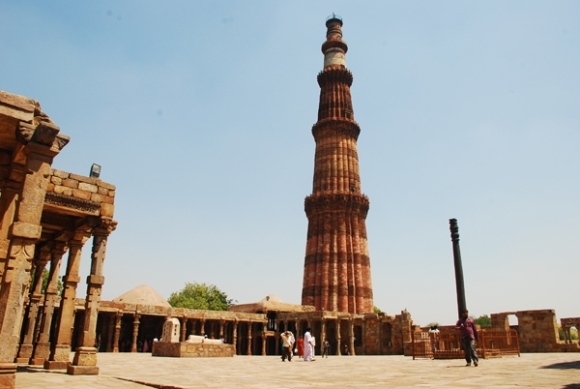 Qutb Minar is another famous attraction in Delhi. It is the tallest brick minaret in the world (72.6 m). It is a part of UNESCO heritage site. The construction started in 1193 and finished in 1368. The minaret is surrounded by a several ancient and medieval ruins. Chandni Chowk is a very popular street market in Delhi. The legend says that is was created by Shah Jahan so that his daughter had a place to shop. 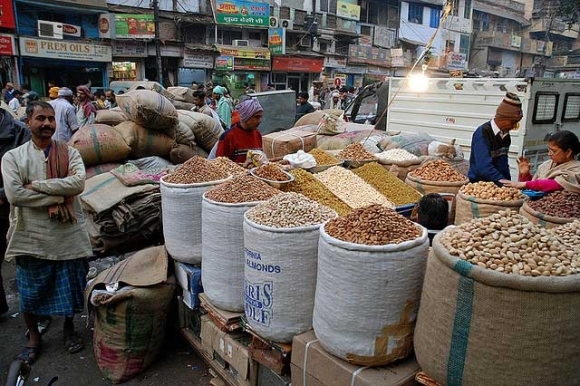 Now Chandni Chowk is the largest wholesale market in Asia. Many tourists visit this market to see and feel the true color of India. 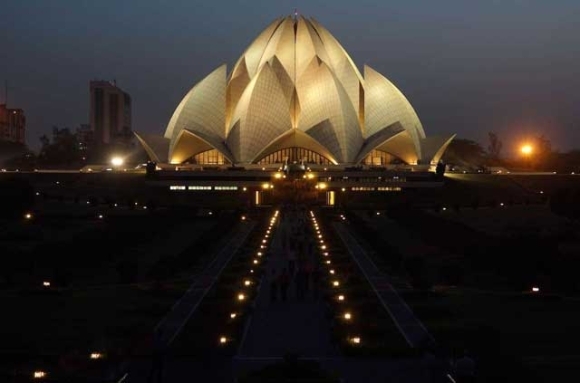 Lotus Temple is one of the most popular attractions in Delhi. The construction works were finished in 1986. It got attention from the architectural, religious, governmental and other circles and won many different architectural awards. It is built in the form of lotus and you will find no straight line in the whole temple. It is open to everyone no matter what your religious beliefs are. Lotus Temple is one of the most visited architectural structures in the world. It is visited even more than Taj Mahal. 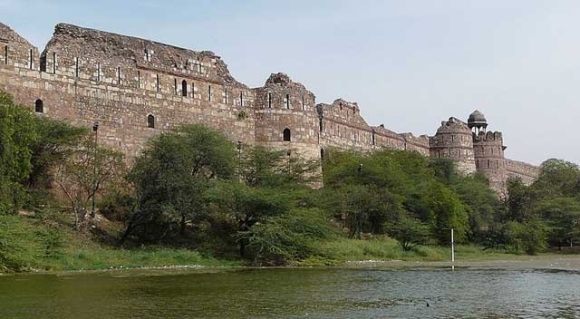 Purana Qila (which means Old Fort) is a great example of the medieval military architecture. It was built in 1533 and its walls go up to 18 meters. The main priorities while building this fort were the practical ones. So, it looks very simple yet it did a great job protecting the fort from enemies. Hindu Temple Laxminarayan was built in 1933-1939 in honor of Laxmi (Hindu goddess of abundance, prosperity and wealth) and her husband Narayan (well-known Godhead in Hindu religion). The temple is decorated with carving that shows the scenes from Hindu mythology. 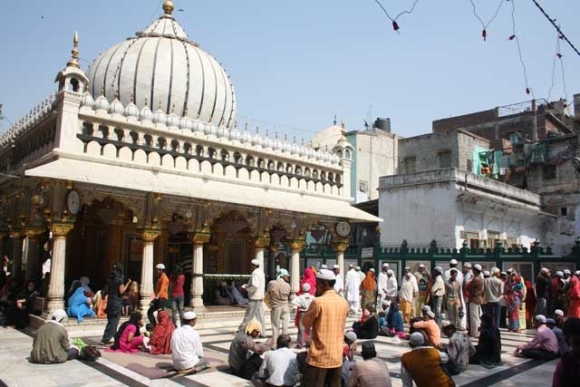 Nizamuddin Dargah is the place where people worship of one of the most notorious Sufi saints in the world — Nizamuddin Auliya. The dargah is visited every day by thousands of Muslims as well as Hindus, Christians, representatives of other religions and just tourists. 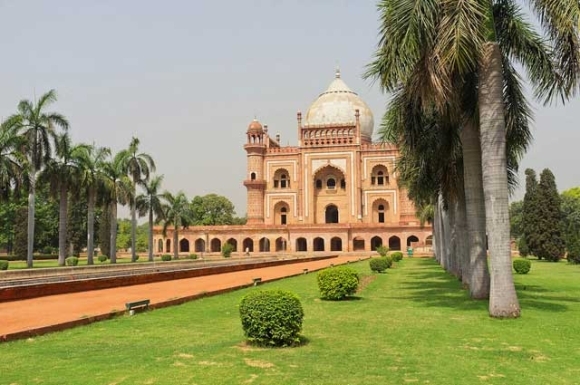 Tomb of Safdarjung is amarble mausoleum of Safdarjung, the prime minister of the Mughal emperor Muhammad Shah. The mausoleum was built in 1754 and characterized as the “last bright glare of the Mughal architecture”. 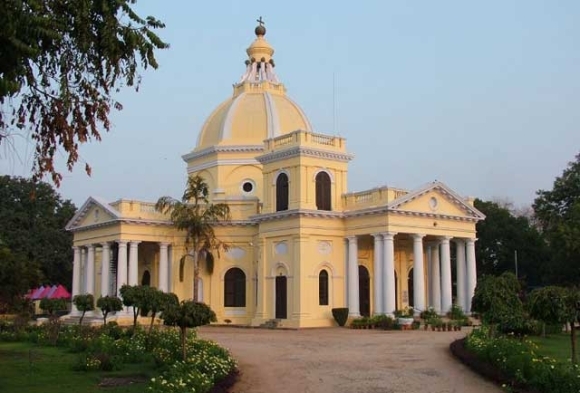 St. James’ Church is an Anglican Church in Delhi, built in 1836 by the colonel James Skinner. It is one of the oldest Christian churches in the city. Jama Masjid is the main mosque of the old Delhi. It was built in 1628 on the order of the Mughal emperor Shah Jahan. It is the largest and most famous mosque in the whole country. The inner square can seat 25 000 visitors. 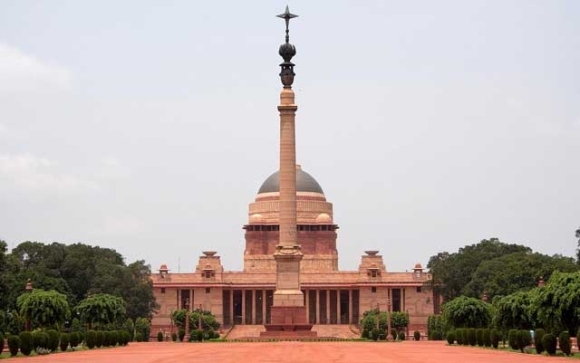 Rashtrapati Bhavan is the official residence of the Indian President in New Delhi. Now it is the biggest president’s residence in the world. The construction works continued for 19 years. The building numbers 340 rooms. The garden in front of Rashtrapati Bhavan is open for visitors every February.